For the second year in a row, Bullz-Eye was invited to Bud Light’s Whatever, USA. Last year’s #UpForWhatever adventure took us to Crested Butte, Colorado, where they painted the town blue, literally. It was a weekend of epic proportions, and we couldn’t wait to see how this year’s event would compare. 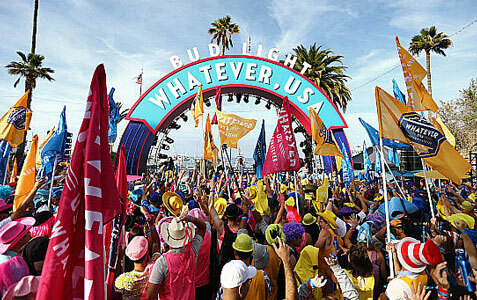 For Whatever, USA 2.0, Bud Light took over the quiet town of Avalon on Catalina Island, California, throwing a two-day rager for some 1,000-plus contest winners from all across the United States who earned their invitations by proving that they were Up For Whatever. Day One started painfully early, with a 7am flight from Philadelphia to Los Angeles. Despite the fact that we had 10 other winners on the flight, it was pretty chill at first, as most of us were still half asleep at this point. But once we arrived in LAX and hopped on the party bus that would take us to our ferry in San Pedro, it was a whole other story! The Bud Light started flowing almost immediately, and everyone was amped up for whatever the weekend had in store for them. After getting checked in at the port, we boarded the ferry that would take us to Catalina Island, our home for the weekend. Once we got there, we dropped off our bags at the hotel, changed into our swim trunks, and immediately headed off to a pool party they were hosting, where there was plenty of food, Bud Light and a bevy of gorgeous bikini-clad women. Yes, suddenly that early wake-up call didn’t seem so bad anymore. 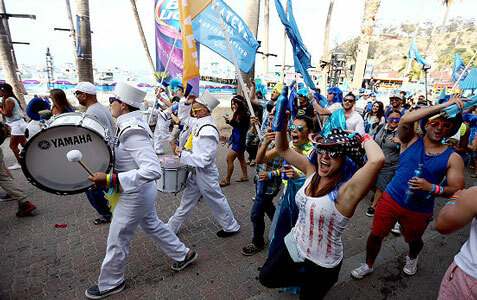 The festivities officially began Friday evening, with a crazy color-themed welcome parade and performances by Elliphant and T-Pain. People were having a blast, and the energy was contagious. Later that night, we went down the beach for a DJ show featuring Diplo and Jack Novak. 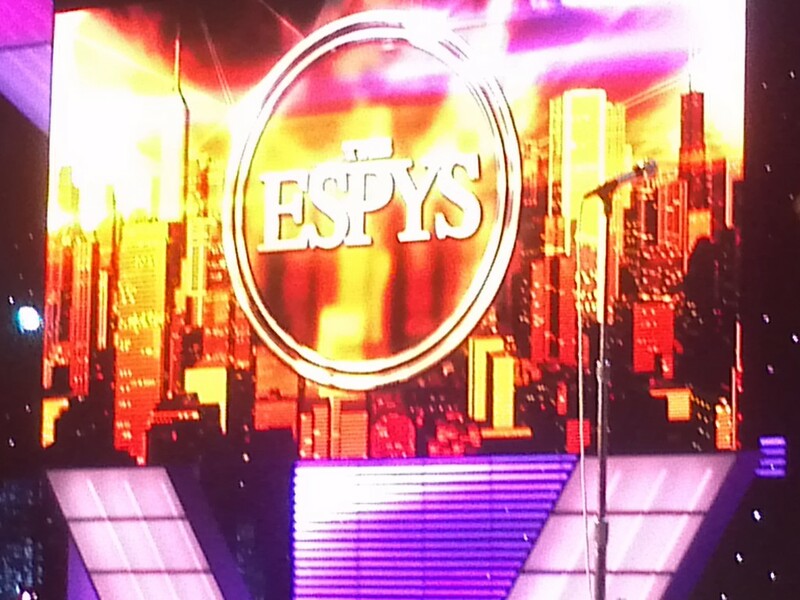 It was pretty awesome, with a 42-foot LED dragon, electro hula hoopers, light shows and more. Eventually, we had to call it a night and get some rest for the next day’s activities. 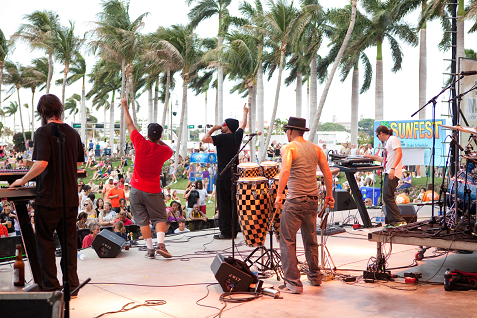 Florida’s largest music, art and waterfront festival, SunFest, kicked off last night in West Palm Beach and Bullz-Eye.com will be there this weekend to cover the festivities. Counting Crows kicked things off last night and an impressive lineup of acts will follow throughout the weekend. Highlights include Snoop Dogg, who will perform on the Bank of America Stage tonight. Other notable acts include Creed, Pitbull, The Fray, Wiz Khalifa, Passion Pit, Paul Rodgers, Third Eye Blind, Girl Talk, Foreigner, Joan Jett & The Blackhearts, The Mighty Mighty Bosstones, Michael Franti & Spearhead, Herbie Hancock, Matisyahu, Coheed & Cambria, All American Rejects, NEEDTOBREATHE, SOJA, The Marshall Tucker Band, The Outlaws and Fab Four. Check out the website for show times and more information and enjoy the music! Ah, St. Patrick’s Day, where everyone is Irish for a day. March seems to be full of days like that, since Fat Tuesday is the day where everyone is Catholic for a day. 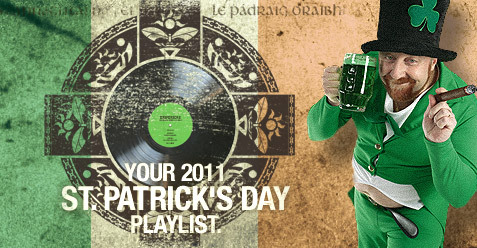 Since we know many of you will be getting a full-fledged drink on this St. Paddy’s Day, especially since it is also the first day of the NCAA tournament, we have provided a small list of songs about drinking, the effects of drinking, and the vow that many of you will make the following morning. Think of it as the bender that you never took; we love booze as much as the next guys, but sometimes those things are better lived vicariously. “It’s Time to Party,” Andrew W.K. With a whopping three songs about partying on his debut album, Andrew W.K. will forever remain our master of ceremonies when it comes to partying. Until we saw the grammar-challenged lyric video, though, we didn’t know this song made a reference to a money shot. Yikes. The night is young. Everyone is flush with cash and feeling generous. Try and remember this moment when 1:30 rolls around and you’re buying Natural Light pounders. For now, though, you’re living on the top shelf. Say, did you hear about Snoop Dogg blowing up an armored car in the middle of the Nevada desert as part of a publicity stunt to celebrate the 10 millionth visitor to Zynga’s latest “Mafia Wars” expansion, “Mafia Wars: Las Vegas”? Maybe you did. Maybe you even watched it happen at MafiaWars.com, since the event was streamed live…and if you did watch it live, then you no doubt noticed that, despite the designated start time having been established as 6 PM PST, it didn’t actually go down ’til a little bit later. Yeah, I noticed it, too. Except I noticed it live from the Nevada desert, since I was standing right there when the whole thing went down. And it wasn’t much of a surprise to me, since I’d been watching the events unfold for the previous two hours. And, now, here’s the story of what happened and how I came to be there.